Sunshine Island sounds like a nice place to live. Greg: I gotta drive over to the next state, Keystone. Pearl: You mean the Keystone State? Greg: Right, the state named Keystone. — Steven Universe, "Keystone Motel"
Speculative Fiction trope wherein the United States of America is significantly different from real life. Perhaps it has broken up or expanded beyond its borders, is replaced by a completely different entity, or become a dictatorship. Whatever the case, we ain't in Kansas no more. Or at least, Kansas as we know it. If it involves changing what is already history to us, then it overlaps with Alternate History. Otherwise, it's probably a story set 20 Minutes into the Future. America Is Still a Colony: The United States is still a colony of the United Kingdom. Americasia: The United States with major Asian influences. Divided States of America: The United States splits apart, often due to a second Civil War. Evil States of America: The United States becomes The Empire. Expanded States of America: The United States gains extra states. America Takes Over the World: The United States rules the world. Fallen States of America: The United States becomes a lesser power. Fantasy Americana: The United States as a magical setting. Invaded States of America: The United States gets invaded by a foreign power. Oppressive States of America: The United States becomes a dictatorship. Please only list examples here that don't fit into any of the Sub Tropes above. In the Arrowsmith series, the United States of America is known as the United States of Columbia due to the magical races choosing to reveal themselves during the signing of the Peace of Charlemagne, their version of what we call the Pax Nicephori in our world. Judge Dredd: Before the Dark Judges slaughtered everyone, the Alternate Universe of Deadworld used to have a state called Tuscarora, which was home to the community of Silver Creek. Watchmen: The United States won the Vietnam War thanks to Dr. Manhattan, the 22nd amendment was repealed and Richard Nixon is serving his fifth term, electric cars and airships are commonplace, and non-government sanctioned vigilantism was outlawed in 1977. White Man's Burden is set in an alternate United States that is very much the same as the real life version, except that race relations are reversed, with blacks as the social majority and whites as the social minority. The United States in Frontier Magic is one where its westward expansion was halted by the presence of dragons and other magical creatures. In Steven Barnes' Alternate History series Lion's Blood, where whites are enslaved by blacks, America is called Bilalistan. Ellisberg, NY was turned into the personal fiefdom of the supervillain Nilbog following his trigger event, with his creations attacking any and all outsiders. Madison, WI was one of the cities that was walled off and quarantined following a Simurgh attack in 2009. Dollar coins are used as the primary legal tender instead of dollar bills. 9/11 and the levee failures caused by Hurricane Katrina didn't happen because of Scion's influence. The Republic of New Sparta is the result of the American Revolution being salvaged by the more militant southern colonies after the north was crushed by the British. The Kingdom of America is the result of the failures of the Constitutional Convention leading to George Washington needing to seize total control with the Continental Congress, setting up a constitutional monarchy with himself as the founder of a new dynasty. In The Ruins of an American Party System, Alaska is deemed too sparsely populated to become a state. Puerto Rico, on the other hand, does achieve statehood. Apart from the backstory of aliens crashing on Earth, the United States in Alien Nation is one where Puerto Rico became a state and the Equal Rights Amendment managed to pass. In Power Rangers the city of Los Angeles was first settled by the British instead of the Spanish and is called Angel Grove, and a number of other cities have alternate names, indicating similar alternate histories; most prominently, Boston was named Corinth in Power Rangers RPM. In the Alternate Universe of Fringe, the United States is quite a different place. A map is visible in Walternate's office at the Department of Defense that shows that Texas is divided into North and South Texas, the Dakotas and Carolinas have each been combined into one state, Oklahoma and Kansas are merged into a new state called Midland, Washington State is called Southern British Columbia, Michigan's upper peninsula is missing, Louisiana is a territory, Nevada is called Independent Nevada, and the two Virginias are still combined and are labeled the District of Virginia, suggesting it's not a state. The most puzzling change is that California's coastline is several hundred miles inland and fractured-looking, suggesting it might have suffered a fringe-induced seismic event that sent most of it into the ocean. In the Fallout universe, prior to the Great War, the United States reincorporated the 50 states into 13 Commonwealths in 1969, in emulation of the original 13 colonies, and to help the country present a more united front against Communism. They had a secondary purpose of creating an intermediate body between the state and federal governments, creating legislation that would positively affect individual blocs without interfering with others, but it ultimately ended up causing more infighting as the commonwealths fought to gain national primacy at the expense of all the others. The United States in Grand Theft Auto, while real world locations are often mentioned, only fictional locations are visited, and in many cases both the real location and its fictional counterpart are mentioned. It's implies there's still 50 states, despite the addition of fictional states such as Liberty State, Alderney, North Yankton, and San Andreas. Cities get the same treatment, with Liberty City, Alderney City, Vice City, and Los Santos featuring prominently in the series, among others. The Divergences mod for Victoria II features a very different world, but its 1836 still has an Eastern Seaboard-centred union of republics descended from European colonisation. It is called the Belgian Confederacy (as a result of the colonists mostly coming from the Low Countries area of Burgundy), and in an earlier version was called the Seven Republics. The Arcadian Union will also be this if it is formed, being a democratic republican union covering much of North America and having the name of the country be that of the continentnote in Divergences, what we know as North America is called Arcadia, while South America is Ameriga — Arcadia is also used as the default name for a union that can be formed by several of the Arcadian countries, with Arcadian Union being the name used if it is a republican democracy (although given one of possible founders is a parliamentary monarchy, Arcadian Empire is equally likely...)..
Steven and company live in the state of Delmarva, which is a version of the Delmarva Peninsula that's a state instead of just a landform. 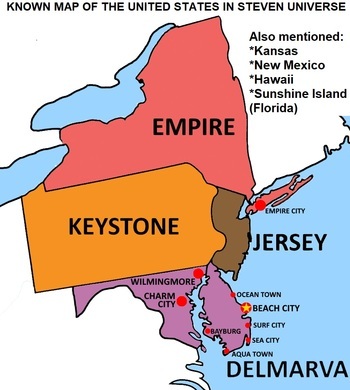 Other alternate names include Keystone (Pennsylvania), Empire State (New York), and Jersey (New Jersey) all after real life nicknames for said places. Jamie mentions the movie industry being focused in Kansas, and one of the show's staff specified he meant what we call Kansas City, implying there is no state called "Kansas" (because the city came first and then appended "city" to its name after the state was formed). Conversely, according to the show's podcast, California in this universe could be better described as "Califarmland". Florida south of the Panhandle has partially geologically separated from North America and has become a small archipelago. The $1 bill has a diamond and the snake from Benjamin Franklin's famous "Join or Die" political cartoon instead of Washington's face, and there are also $3 dollar bills.